Inside: How to paint perfect paint lines on textured walls. 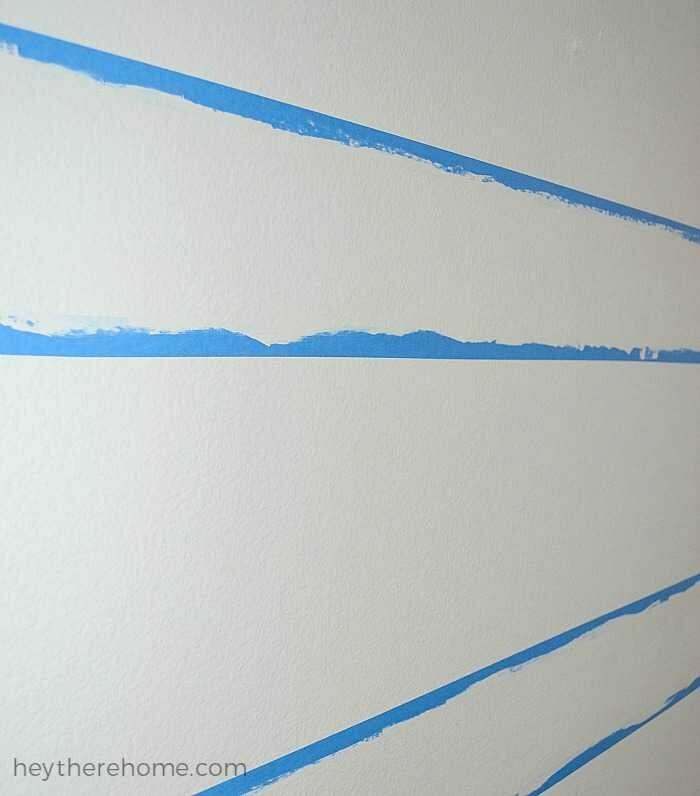 A must do when painting stripes or other shapes on walls and only requires one easy extra step! Painting perfect stripes on walls is a must! Nothing drives me more batty than flubbed up paint lines, so when my mom ordered stripes on the walls of the Grandkid’s Bedroom Makeover that I’m helping her with, I came prepared to take the time to make them right. So I’ve got the easy steps to paint perfect paint lines below + a video to show you the steps and what I’ve been able to create with this simple trick! How I get perfect paint lines EVERY time — even on textured walls. Step 1: Paint the walls with your base color. 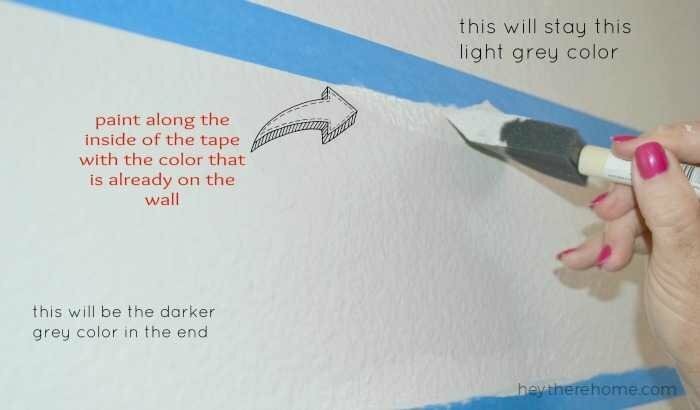 Paint the entire wall the lighter of the two colors that you’ll be using. Let it dry COMPLETELY —overnight at least. Decide how thick you want your stripes or what shape you’re creating. Do the math, measure out the placement of the stripes, and tape them accordingly using painter’s tape. Tip: Take a paper towel or dish towel and place it over your finger. Then press down firmly and rub on the tape line making sure it has no air bubbles and is on the wall with as few little gaps between the tape and the wall as possible. 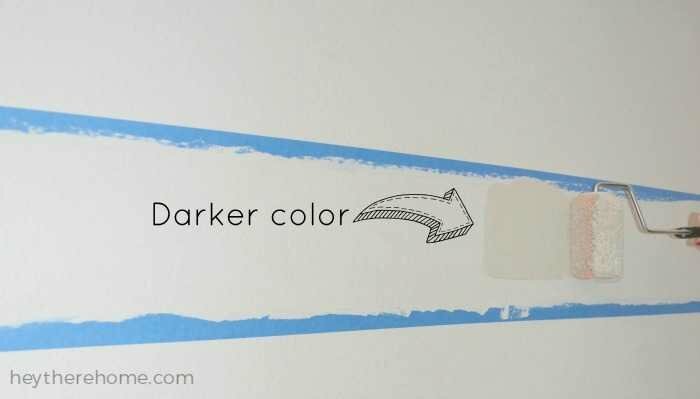 With the SAME color that the wall is already painted (your base color) paint along the tape line only on the edge that will eventually be the darker color. Tip: If you don’t have the original color, use a clear paint in a sheen that is similar to the existing wall color. Let the paint along the painters tape dry completely. It will look something like this. 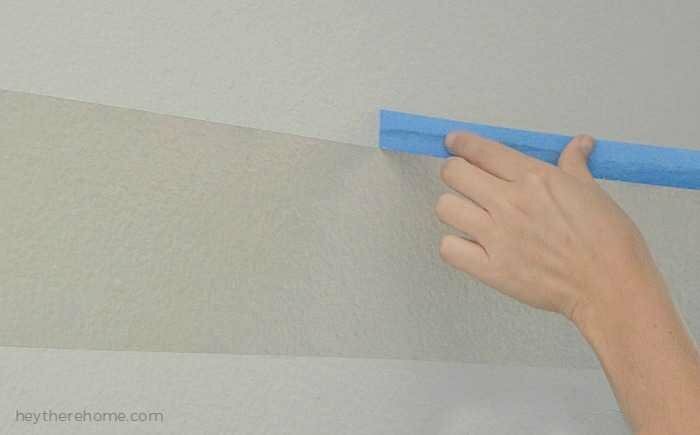 If there were any gaps between the painter’s tape and the wall they will be filled and sealed with the already existing wall color which means when you add your second color it won’t be able to seep under the tape. Step 4: Add your second color. Once the paint along your tape is dry, paint the stripes the desired color –darker grey in my case. If you need two coats of paint, let the first one dry before adding your second coat. Step 5: Remove the tape slowly. Remove the tape while your paint is still wet. If you did two coats remove the paint right after applying the second coat. 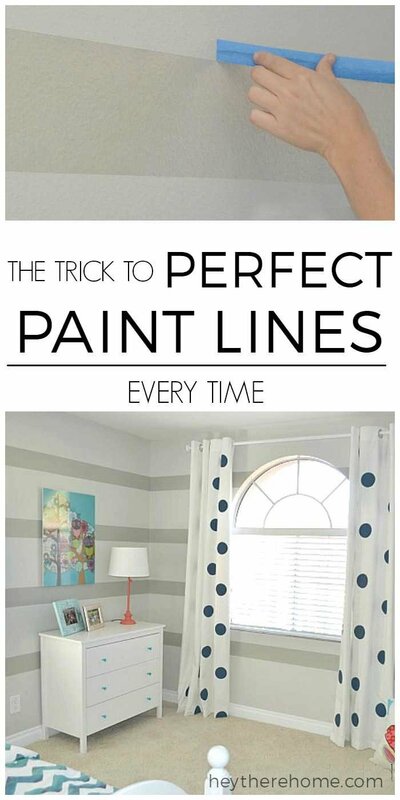 As soon as you pull the tape you’ll reveal your perfect paint lines! Such an easy way to get a super professional look. This is amazing! I would have never thought to paint a little of the lighter color on the edge. Can’t wait to try it when I do stripes in my daughter’s room this spring! Love this! Always need new paint tips! I would have never thought of this! Now I will have extra hours not having to go back and touch up the leaks that went under the tape! Awsome! Hi! I found your site via One Project Closer: The Better Half. The stripes look great! I think it’s a great way to give neutral walls affect. My question is, will this technique work for stencils as well? Ah! So that’s how you do it. Cool! Great tips – pinning – thank you! Visiting from The Girl Creative and started following you via Bloglovin! Can’t wait to see what’s to come! Great tip! I’m going to pin this now in case I end up painting stripes again! We painted a small stripe in our daughter’s bedroom years ago. I wish I would have known about this technique then because it would have saved us a bunch of time! Thanks so much for linking up to Frugal Crafty Home! Such a simple tip, but it makes such a difference. I tried to paint a canvas a while ago, but forgot to do this (I know, I know) and had so much paint bleed under the tape that I painted over the whole thing in a solid color. Boo. Currently it’s covered in fabric & propped in our bedroom. I should try it again, correctly this time! PS Thanks for stopping by my blog & following on bloglovin. Following you too. PS Those stripes look awesome!! !